This option allows the admin to edit PBX Queue settings. PBX Queues are the PBX way of handling calls directly in this queue. This is different from Call Center Queues. 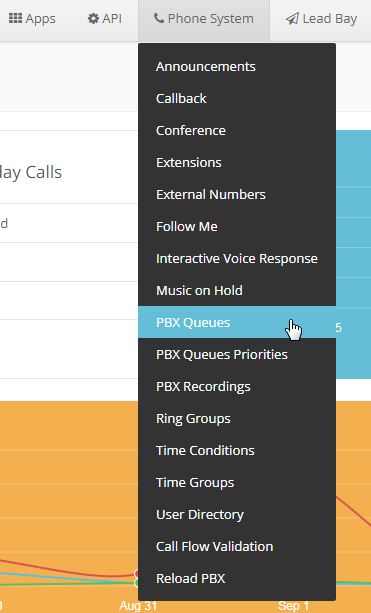 From the Dashboard, click on Phone System and select PBX Queues. Under Show Queues, select the Queue description that you want to edit then click on the drop down arrow under action and click on Edit. Once you click on Edit you can now change the settings of the Queue that you selected. In this section the admin can edit the settings for General, Timing and Agent, Capacity Settings, Announcements Settings and Additional Configuration. Queue Number - The number of this Queue. Description - Provide a descriptive title for this Queue. Password - You can require agents to enter a password before they can log in to this queue. Generate Device Hints - This setting is optional. The password is only used when logging in with the legacy queueno* code. When using the toggle codes, you must use the Restrict Dynamic Agents option in conjunction with the Dynamic Members list to control access. where *45 is the currently defined toggle feature code, ddd is the device number (typically the same as the extension number) and qqq is this queue's number. Call Confirm - If checked, any queue member that is actually an outside telephone number, or any extensions Follow-Me or call forwarding that are pursued and leave the PBX will be forced into Call Confirmation mode where the member must acknowledge the call before it is answered and delivered. Call Confirm Recording - Announcement played to the Queue Member announcing the Queue call and requesting confirmation prior to answering. If set to default, the standard call confirmation default message will be played unless the member is reached through a Follow-Me and there is an alternate message provided in the Follow-Me. This message will override any other message specified. To add additional recordings please use the Recordings MENU to the left. CID Name Prefix - You can optionally prefix the CallerID name of callers to the queue. i.e. : If you prefix with Sales:, a call from John Doe would display as Sales:John Doe on the extensions that ring. Wait Time Prefix - When set to Yes, the CID Name will be prefixed with the total wait time in the queue so the answering agent is aware how long they have waited. It will be rounded to the nearest minute, in the form of Mnn: where nn is the number of minutes. If the call is subsequently transferred, the wait time will reflect the time since it first entered the queue or reset if the call is transferred to another queue with this feature set. Static Agents - Static agents are extensions that are assumed to always be on the queue. Static agents do not need to 'log in' to the queue, and cannot 'log out' of the queue. If your 'Agent Restrictions' are not set to 'Extension Only' you will have problems with subsequent transfers to voicemail and other issues may also exist. Add External Number - Add custom phone number to "Static Agents". Dynamic Members - Dynamic Members are extensions or callback numbers that can log in and out of the queue. When a member logs in to a queue, their penalty in the queue will be as specified here. Extensions included here will NOT automatically be logged in to the queue. Restrict Dynamic Agents - Restrict dynamic queue member logins to only those listed in the Dynamic Members list above. When set to Yes, members not listed will be DENIED ACCESS to the queue. Agent Restrictions - When set to 'Call as Dialed' the queue will call an extension just as if the queue were another user. Any Follow-Me or Call Forward states active on the extension will result in the queue call following these call paths. When set to 'No Follow-Me or Call Forward', all agents that are extensions on the system will be limited to ringing their extensions only. Follow-Me and Call Forward settings will be ignored. Any other agent will be called as dialed. This behavior is similar to how extensions are dialed in Ring Groups. When set to 'Extensions Only' the queue will dial Extensions as described for 'No Follow-Me or Call Forward'. Any other number entered for an agent that is NOT a valid extension will be ignored. No error checking is provided when entering a static agent or when logging on as a dynamic agent, the call will simply be blocked when the queue tries to call it. For dynamic agents, see the 'Agent Regex Filter' to provide some validation. wrandom : random using the member's penalty as a weighting factor. Autofill - If this is checked, and multiple agents are available, the PBX will send one call to each waiting agent (depending on the ring strategy). Otherwise, it will hold all calls while it tries to find an agent for the top call in the queue making other calls wait. Skip Busy Agents - When set to 'Yes' agents who are on an occupied phone will be skipped as if the line were returning busy. This means that Call Waiting or multi-line phones will not be presented with the call and in the various hunt style ring strategies, the next agent will be attempted. Queue Weight - Gives queues a 'weight' option, to ensure calls waiting in a higher priority queue will deliver its calls first if there are agents common to both queues. Music on Hold Class - Music (MoH) played to the caller while they wait in line for an available agent. Choose "inherit" if you want the MoH class to be what is currently selected, such as by the inbound route. MoH Only will play music until the agent answers. Agent Ringing will play MoH until an agent's phone is presented with the call and is ringing. If they don't answer, MoH will return. Ring Only makes callers hear a ringing tone instead of MoH ignoring any MoH Class selected as well as any configured periodic announcements. This music is defined in the "Music on Hold" Menu. Join Announcement - Announcement played to callers prior to joining the queue. This can be skipped if there are agents ready to answer a call (meaning they still may be wrapping up from a previous call) or when they are free to answer the call right now. To add additional recordings please use the "Recordings" MENU to the left. Call Recording - Incoming calls to agents can be recorded. Recording Mode - Choose to 'Include Hold Time' in the recording so it starts as soon as they enter the queue, or to defer recording until 'After Answered' and the call is bridged with a queue member. Caller Volume Adjustment - Adjust the recording volume of the caller. Agent Volume Adjustment – Adjust the recording volume of the queue member (Agent). Mark calls answered elsewhere - Enabling this option, all calls are marked as 'answered elsewhere' when cancelled. The effect is that missed queue calls are *not* shown on the phone (if the phone supports it). Click on the drop down arrow to select the Destination for Fail Over. Max Wait Time - The maximum number of seconds a caller can wait in a queue before being pulled out. (0 for unlimited). Max Wait Time Mode - PBX timeout priority. In 'Strict' mode, when the 'Max Wait Time' of a caller is hit, they will be pulled out of the queue immediately. In 'Loose' mode, if a queue member is currently ringing with this call, then we will wait until the queue stops ringing this queue member or otherwise the call is rejected by the queue member before taking the caller out of the queue. This means that the 'Max Wait Time' could be as long as 'Max Wait Time' + 'Agent Timeout' combined. Agent Timeout - The number of seconds an agent's phone can ring before we consider it a timeout. Unlimited or other timeout values may still be limited by system ring time or individual extension defaults. Agent Timeout Restart - If timeout restart is set to yes, then the time out for an agent to answer is reset if a BUSY or CONGESTION is received. This can be useful if agents are able to cancel a call with reject or similar. Retry - The number of seconds we wait before trying all the phones again. Choosing "No Retry" will exit the Queue and go to the fail-over destination as soon as the first attempted agent times-out, additional agents will not be attempted. Wrap-Up-Time - You can also set the 'Honor Wrap up Time Across Queues' setting on the Advanced Settings page so that this is honored across queues for members logged on to multiple queues. Member Delay - If you wish to have a delay before the member is connected to the caller (or before the member hears any announcement messages), set this to the number of seconds to delay. Example: "the Following call is from the Sales Queue" or "This call is from the Technical Support Queue". To add additional recordings please use the "Recordings" MENU to the left. Compound recordings composed of 2 or more sound files are not displayed as options since this feature cannot accept such recordings. Report Hold Time - If you wish to report the caller's hold time to the member before they are connected to the caller, set this to yes. Auto Pause - Auto Pause an agent in this queue (or all queues they are a member of) if they don't answer a call. Specific behavior can be modified by the Auto Pause Delay as well as Auto Pause Busy/Unavailable settings. Auto Pause Delay - This setting will delay the auto pause of an agent by auto pause delay seconds from when it last took a call. For example, if this were set to 120 seconds, and a new call is presented to the agent 90 seconds after they last took a call, they will not be auto paused if they don't answer the call. If presented with a call 120 seconds or later after answering the last call, they will then be auto paused. If they have taken no calls, this will have no effect. Yes Always allows the caller to join the Queue. Strict Same as Yes but more strict. Simply speaking, if no agent could answer the phone then don't admit them. If agents are inuse or ringing someone else, caller will still be admitted. Ultra Strict Same as Strict plus a queue member must be able to answer the phone 'now' to let them in. Simply speaking, any 'available' agents that could answer but are currently on the phone or ringing on behalf of another caller will be considered unavailable. No Callers will not be admitted if all agents are paused, show an invalid state for their device, or have penalty values less than QUEUE_MAX_PENALTY (not currently set in FreePBX dialplan). Loose Same as No except Callers will be admitted if there are paused agents who could become available. Yes Callers will exit if all agents are paused, show an invalid state for their device or have penalty values less than QUEUE_MAX_PENALTY (not currently set in FreePBX dialplan).. Strict Same as Yes but more strict. Simply speaking, if no agent could answer the phone then have them leave the queue. If agents are in use or ringing someone else, caller will still be held. Ultra Strict Same as Strict plus a queue member must be able to answer the phone 'now' to let them remain. Simply speaking, any 'available' agents that could answer but are currently on the phone or ringing on behalf of another caller will be considered unavailable. Loose Same as Yes except Callers will remain in the Queue if there are paused agents who could become available. No Never have a caller leave the Queue until the Max Wait Time has expired. Penalty Members Limit - A limit can be set to disregard penalty settings, allowing all members to be tried, when the queue has too few members. No penalty will be weighed in if there are only X or fewer queue members. Frequency - How often to announce queue position and estimated hold time (0 to Disable Announcements). Announce Position - Announce position of caller in the queue? IVR Break Out Menu - You can optionally present an existing IVR as a 'break out' menu. This IVR must only contain single-digit 'dialed options'. The Recording set for the IVR will be played at intervals specified in 'Repeat Frequency', below. Repeat Frequency - How often to announce a voice menu to the caller (0 to Disable Announcements). Event When Called - When this option is set to YES, the following manager events will be generated: AgentCalled, AgentDump, AgentConnect and AgentComplete. ^([0-9]+)$ would allow any number of any length, but restrict the * key. WARNING: make sure you understand what you are doing or otherwise leave this blank! If Randomize is selected, a similar frequency will be followed, only the exact times will be randomized (avoiding peak business hours, when possible). Please note: randomized schedules will be rescheduled (randomly) every time ANY backup is saved. Never will never reset the queue stats automatically.